Gas fires can occasionally go wrong, but luckily there are only a few main causes. The most common one....the dreaded pilot assembly. This is a simple bit of a fire, which is the main connection between flame and gas...so also quite important. If you hear your fire click several times, and the gas is turned on but no flames, then its probably to do with this small section of burner. How does a Gas Fire Pilot light Work? The pilot assembly main job is to light the gas. When you turn your gas knob (or push the button on your remote if your fancy) this firstly turns on a small bit of gas to the pilot pipe [small side pipe from main gas supply], you can see the top of the gas pipe on the bottom left (the brass pipe). As you continue to turn the knob you feel a click, this is the peizio ignition, basically a small bit of electronics that turns kinetic energy into electricity, so when this part clicks an electric voltage is sent up through the blue electric wire you see on the right, and this jumps from the wire at the top and creates a spark. Because the gas is leaking out then it will light it. Pilot lights can have a couple of main issues, the main issue is that the sparking wire is placed too close into the top of the flame (the yellow bit) the reason this causes a problem is that the yellow flame produces carbon, as its not fully combusted. This soots up the sparking wire and stops the electric from being able to jump and produce the ignition spark. The second problem is quite a simple one, the wire that is position in the gas to spark it, is metal, and metal can move in heat, so if you see a spark but it takes while to light, then the reason is because the spark wire has moved away from the gas, so it will not light until more gas has entered the fire and makes it easier to spark. This is quite a dangerous thing, as with open fronted fires, this can mean you have to risk allowing a big build up of gas before sparking. Basic hint...if you can smell gas its not good! If you do not feel any pressure from your control knob or do not hear the fire clicking, then it possible there is an issue with your peizio ignition / Battery pack. On some fancy fires if you turn your TV off and put the cat outside you will always hear a clicking noise which in some cases will continue until the main fire lights. Normally this is only for ones with remote controls. This is the pilot continually trying to light the burner and will try about 10 times until the thermocouple heats up. If this doesn't heat up, it is a safety device that will not allow the main gas burner to leak. 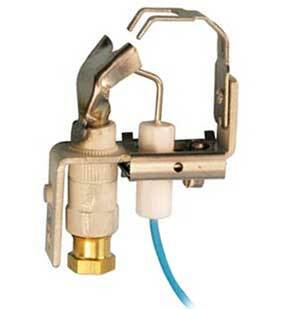 If you try the control knob and there is no click then its time for another Peizio ignition system. Normally a battery should last around 2000 lightnings dependent upon power consumption and size, but this is a good guide. Pilot lights should be a nice blue colour, there not big, but they are quite clever. If yours is large and yellow there is something wrong and you should have a Gas Safe Registered Installer look at it. But with modern technology and prices coming down every day, I'd say it was about time to invest in a High Efficiency Gas Fire, one with a glass front. Just as Fireplace Megastore how they can benefit you.